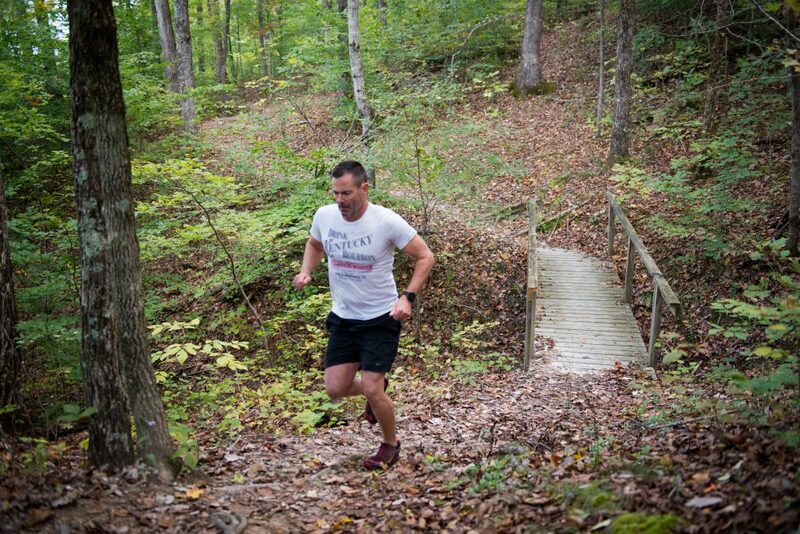 Don’t underestimate this trail: plan and prepare accordingly. Make sure you take along some basic provisions, including food and water. And we’ve included a map (see below) to help guide the way. 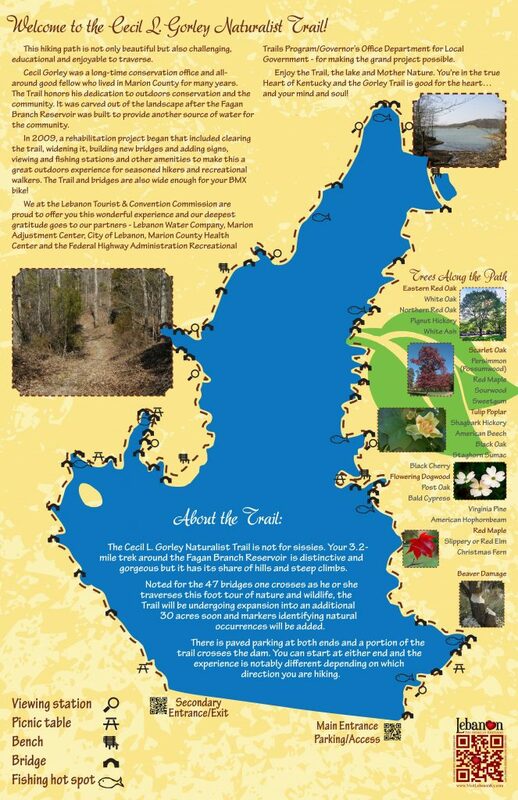 The Cecil L. Gorley Naturalist Trail is also a challenging mountain bike trail. A few hills are very, very demanding, whether you’re dealing with them going up, or coming down! 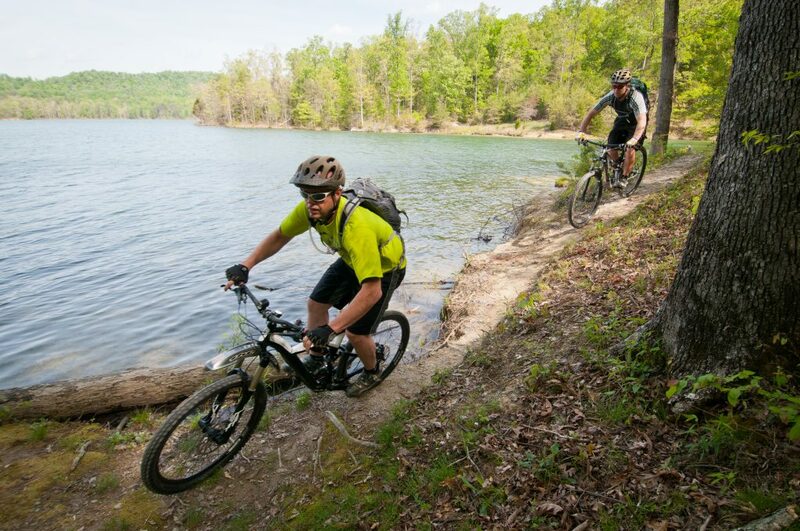 Make sure you wear a helmet and appropriate safety gear; we recommend you don’t bike alone; stay alert and share the trail with hikers; and please don’t ride when the trail is wet and muddy. In addition to being unsafe, it can cause damage to the trail. And no, you don’t have to have a boat. You can access numerous fishing spots on foot (see map below), including some you’ll need to hike to and will make you feel remote. And yes, you can launch a boat from from an established ramp. But please remember that gasoline engines are not allowed to be used on the water—electric trolling motors, only. All Kentucky and local fishing regulation apply; please check them before fishing. 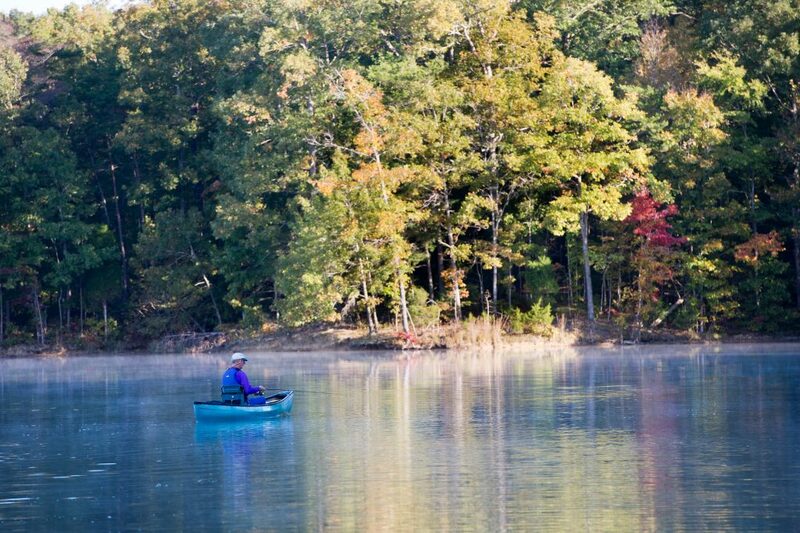 And Fagan Branch is an extremely popular and beautiful place for self-powered watercraft, including kayaks and canoes. Early mornings and sunset time—both can be beautiful moments to be on the lake. ~No ATVs—four-wheelers, Razors and the like—are allowed on the trail. ~Pets are allowed but must be kept under control with a leash. ~Practice “Leave No Trace!” Take all trash and leftover food and snacks with you. In fact, there are trash receptacles located throughout the trail. ~Respect wildlife. Keep your distance and do not feed animals you might encounter. ~Be considerate of other visitors. Show respect to other trail users. Obey all posted trail rules and signs you might see along the way. AND HOW ABOUT ROAD BIKE OPPORTUNITIES? 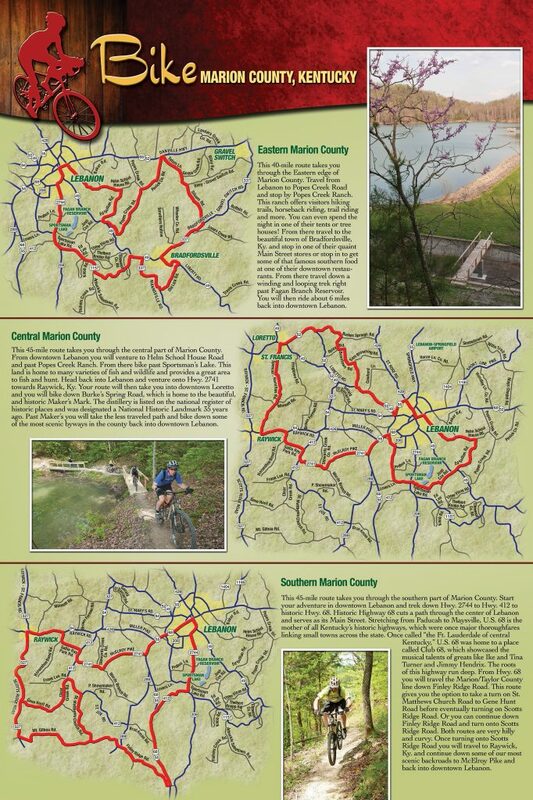 Yes…here in the Heart of Kentucky road biking routes are excellent, traffic much lighter than in metropolitan areas, and the scenery for your ride is going to be superb. 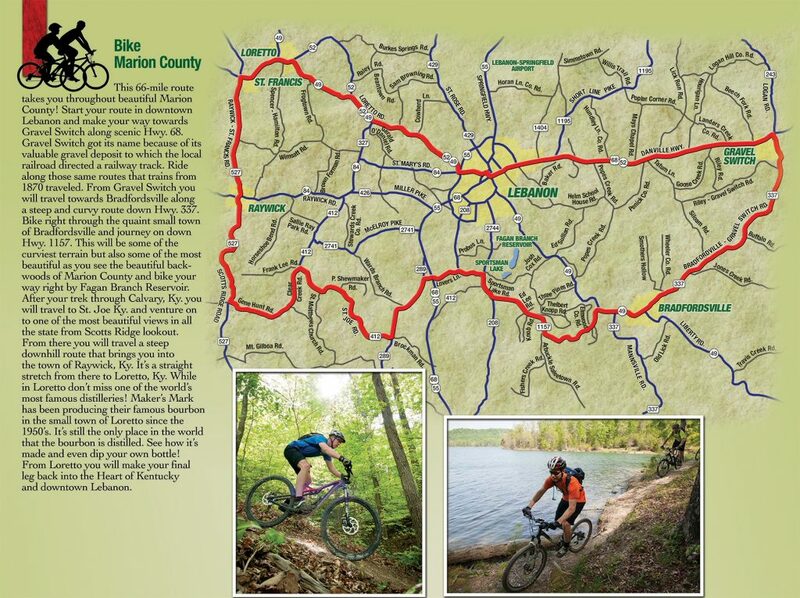 How about the “Bike Marion County” route, a 66-miler that begins in Lebanon and takes you throughout Marion County. And we’ve even already mapped it out for you. We’ve also mapped out a 40-miler in eastern Marion County; a 45-miler in central Marion County, and a 45-miler in southern Marion County. Several of those routes include bourbon-themed stops. And if that’s not enough, then “Bike the Bourbon Trail,” which offers bicyclists an alternative way to experience the state’s legendary distilleries. 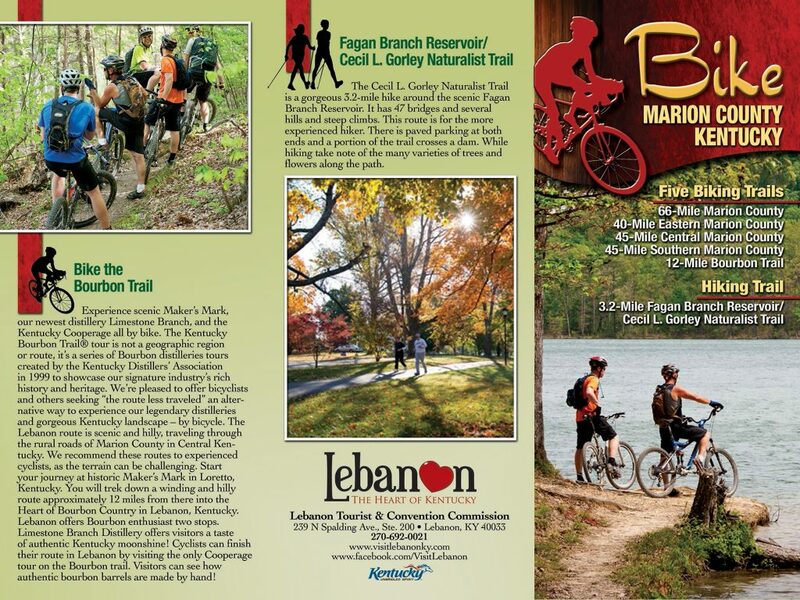 For all the details, we’ve included our Bike Marion County biking brochure in digital format below. It you’d like to have that brochure in hard copy format, just call us at (270) 692-0021 and we’ll mail you one for free.